A Vickie Winans event always promises to be as full of life as the woman herself. That certainly was the case on May 12th, the live recording for Winans' anticipated Woman to Woman: Songs of Life project, for Verity Records. GOSPELflava.com was in the house. The venue was Chicago's House of Hope, and thousands turned out amidst a cold, wet and dreary weather backdrop to experience an evening that had been in works for several months. Among those turning out were Andrae Crouch, Sandra Crouch, Inez Andrews, Teresa Hairston, Don Jackson, Rodney Jerkins, Darius Brooks, Albertina Walker, Dr. Bobby Jones and many other luminaries. Vickie's family and friends were on hand to show their support including husband Joe McLemore, her mom, Mattie Bowman and the Winans' family matriarch, Delores "Mom" Winans and Angie Winans. A tender moment of the evening was when Vickie presented Mom Winans with an award. The evening was hosted by Bishop T.D. Jakes, and featured opening groups such as Kayla Parker, 2 female groups; Prezence and The Miracle Lights ( both signed to Winans' label, Destiny Joy) and Joy Enriquez. The stage was elaborately set up, with orchestra (under the direction of Steven Ford) and full band. Vickie was backed by an impressive group of background singers that was assembled by gospel powerhouse and Chicago native Leanne Fainne. True to form, Vickie made a grand entrance rivaled only to Barbara Streisand's entrance at the MGM Grand at her finale concert singing as she walked down a long staircase. Winans' own material was eclectic, with a traditional edge. 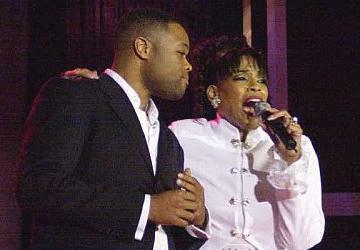 "Stand Up and Carry On" was one of the highlights, allowing Winans to stretch out her vocals. Other songs sure to grab attention on her recording are "I Win", "The Rainbow" and "Stretch Out". Joining Winans on stage was her son, Marvin Winans Jr. Overall, this recording will capture new VIckie fans as well as delight her fan base. The theme throughout, as captured by the album title, are the issues that women everywhere face day in and day out, with Winans framing them in a scriptural context. There will also be a set of studio cuts included on the disc. Vickie Winans' Woman to Woman: Songs of Life is expected to release in August, 2006 on Verity Records.